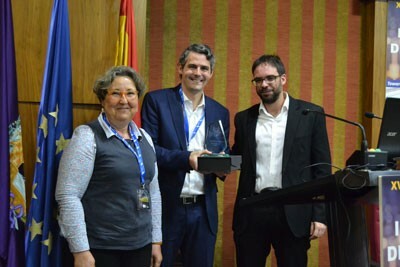 During the XIV edition of the Spanish Congress about Intelligent Transport Systems (ITS), celebrated from Aprils 17 to Aprils 19 in Madrid, Lídia Montero from inLab FIB and Daniel Serra from CARNET have collected the prize about ITS on the Urban Transit category. The entity that has awarded the project, Forum of New Technologies on the Transport: ITS Spain, is a nonprofit association founded on 2002 with the objective to join the public, private and academic sector related with Intelligent Transport Systems. ITS Spain wants to be a meeting point for experience and information exchange and works for the implantation of the intelligent transport management to create an efficient, safe and sustainable mobility on the cities. For the last 8 years the ITS Spain prices have being been granted yearly by the association to that people, entities or projects that have been chosen by the judges between all the proposals done by ITS Spain counselors. ITS Spain has distinguished inLab and CARNET because of the Virtual Mobility Lab project developed between July 2017 and January 2018.